In response to a U.S.Navy request for a cheap, simple, one-man helicopter, numerous "flying motorcycles" with various propulsion systems were built in the 1950's. The Gyrodyne Company of America, located in St.James, produced the XRON Rotorcycle between 1954 and 1956. It had a maximum weight of 688 pounds consisting of counter-rotating (coaxial) rotors, engine, tricycle landing gear, pilot and equipment all mounted on a tubular fuselage. The XRON had a respectable top speed of 70 mph. 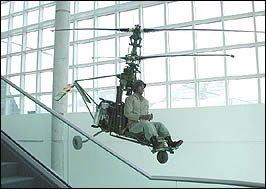 Gyrodyne built 15 Rotorcycles which were evaluated by the Marines as reconnaissance and one-man assault helicopters. A later unmanned derivative was produced in large numbers for the U.S.Navy in the 1960's. One unusual feature of the XRON was the use of small rotortip-mounted drag brakes as an approach to the directional control and stability of coaxial rotor helicopters. The brakes turned the fuselage by unbalancing the torques of the counter-rotating rotors. The XRON was also designed to be flown by personnel with a minimum amount of training and it was extremely maneuverable. The museum's XRON, one of three survivors, was purchased by the Friends for Long Island's Heritage as surplus from the Department of Defense. The helicopter was obtained in flyable condition. It is a rare example of the former helicopter industry on Long Island.